Pool Party + Mountain Camping + Free Liquors +Trekking+ Music + Unlimited Snacks + All Meals+ In-house games + Transport from Delhi to Delhi. Every Friday Our Representative will meet you at Kashmiri Gate or Jhandewalan Pick up points. He will provide Volvo Bus. The bus will departure 10:30 pm from Delhi to Rishikesh. Over Night Journey. Get fresh n up and have your buffet lunch. 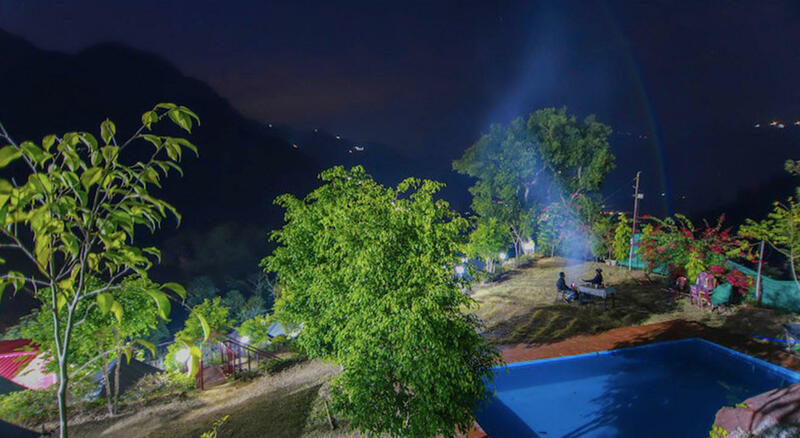 Enjoy some more activities at the campsite like Volley Ball, Cricket, Badminton & Pool etc. Around 4:30 pm assemble for a Nature Trek/ Hiking for approx 1 hr. In the evening the Party will begin- Enjoy the Pool Music Session with bonfire and snacks, unleash your vocals & have a jamming session with the group. Spend overnight at the Camp. you will have the opportunity to explore the immaculate and the stunning landscapes of Rishikesh. Take a stroll around the local market. Don't miss visiting some renowned cafes and the rejuvenating Yoga centers. Have to reach Rishikesh Volvo bus stand around 9 pm. The bus will depart at 9:30 to Delhi. Overnight on the bus. Early morning bus will reach Delhi. Transport from Delhi to Rishikesh & Return. 24 Hours Jungle Camping on the triple basis. 3 Meals: 1 Lunch, 1 Breakfast, 1 Dinner. With Snacks in Evening.